Chickpeas and orzo is a very traditional Greek meal, very filling and very delicately flavored. The secret to it’s creamy, ‘buttery’ goodness is to cook the orzo and canned chickpeas right into the dish, not separately and then added in to the rest of the ingredients as you might find in other variations of this recipe. 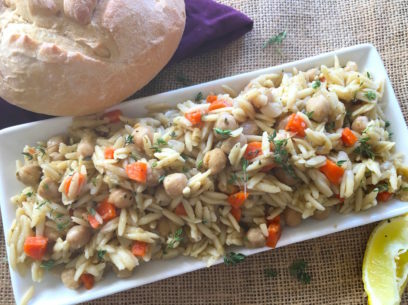 By ‘stewing’ both the orzo and the chickpeas together with the veggies and broth as the dish cooks you get plump, perfect orzo and tender, meaty chickpeas. You can’t beat it! Marjoram is used here instead of oregano for a change. Being less bitter than oregano, marjoram complements the sweetness of the carrots and onions while still bringing an earthy balance to the flavors. Oh, and a good splash of white wine is important too – the acidity of the wine just amplifies the subtle beauty of the flavors so do try to include it! Thyme sprigs, or dried thyme if you don’t have fresh – but fresh is much more preferable, add a light, brightness and a good vegetable broth brings the whole dish together. I use 1, 15 ounce can of chickpeas here but feel free to as much as double up on that amount if you love chickpeas. Depending on who I am making this for, I’ve used the large can size which I believe is 29 ounces? and that’s worked out just fine. Remember to drain them first and use a good quality brand, organic if you can. The last thing you want are sub-par peas! A 3 quart sauce pan just fits this recipe and make sure to have a cover on hand, even if it’s just a cut piece of aluminum foil, to use once you remove the pan from the heat. It’s key to allow the chickpeas and orzo to rest, covered for at least 10 minutes once you take it off the heat. 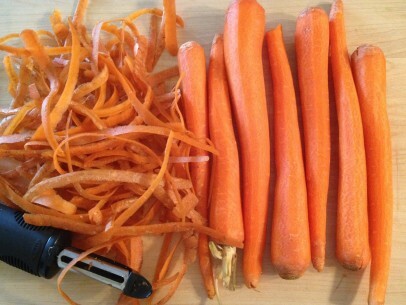 Chop carrots and onions into small dice and sauté in olive oil for approx 5 minutes on low/medium heat. Add salt, pepper, marjoram and thyme sprigs and stir to combine. Add in white wine and then uncooked orzo. Stir to combine and cook on low heat for 5 minutes. Add drained chickpeas and vegetable broth, stir to combine. Bring to a boil, this might take 5 minutes or a bit more. Reduce to a good simmer and cook for 10 minutes. Stir twice while cooking to keep orzo from sticking to bottom of the pan. Gently nudge any that might be sticking, they’ll come right up! Remove pan from heat and cover. 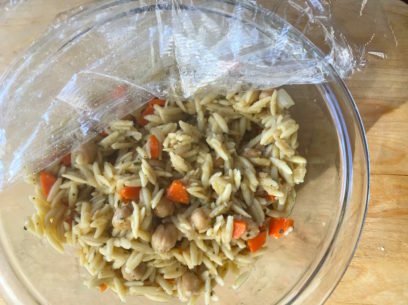 Allow chickpeas and orzo to sit, covered, for 10 minutes before serving. Liquid should be almost fully absorbed. Fluff with fork and serve with crusty bread and a wedge of lemon. Serves 6-8 well and leftovers keep, covered and refrigerated, for up to 3-4 days. When do you add the white wine? Never heard term ‘orzo’ used in this part of the world – is it the small pasta that looks like uncooked rice? Italians (here, anyway) call it ‘risoni’. I can never remember the Greek name for it, but it begins with ‘K’. I made this in a pinch–I happened to have all the ingredients (or solid substitutions!) and my kids really loved it. thanks for sharing!